While the near-zero price is due to the lack of pipeline capacity for a particular variety of ultra low quality crude, it underscores how dire things are in the U.S. oil patch. U.S. benchmark oil prices have collapsed more than 70 percent in the past 18 months and fell below $30 a barrel for the first time in 12 years last week. West Texas Intermediate traded as low as $28.36 in New York. Brent, the international benchmark, settled at $28.55 in London. “Telling producers that they have to pay you to take away their oil certainly gives the producers a whole bunch of incentive to shut in their wells,” Andy Lipow, president of Lipow Oil Associates LLC in Houston, said of the price that was posted as negative until Flint Hills revised it on Monday. Jake Reint, a Flint Hills spokesman, said the price was fixed on the website after the firm incorrectly posted it as negative. The prices reported by Flint Hills Resources and rivals such as Plains All American Pipeline LP are used as benchmarks, setting reference prices for dozens of different crudes produced in the U.S.
Plains All American quoted two other varieties of American low quality crude at very low prices: South Texas Sour at $13.25 a barrel and Oklahoma Sour at $13.50 a barrel. High-sulfur crude in North Dakota is a small portion of the state’s production, with less than 15,000 barrels a day coming out of the ground, said John Auers, executive vice president at Turner Mason & Co. in Dallas. The output has been dwarfed by low-sulfur crude from the Bakken shale formation in the western part of the state, which has grown to 1.1 million barrels a day in the past 10 years. Different grades of oil are priced based on their quality and transport costs to refineries. High-sulfur crudes are generally priced lower because they can only be processed at plants that have specific equipment to remove sulfur. Producers and refiners often mix grades to achieve specific blends, and prices for each component can rise or fall to reflect current economics. 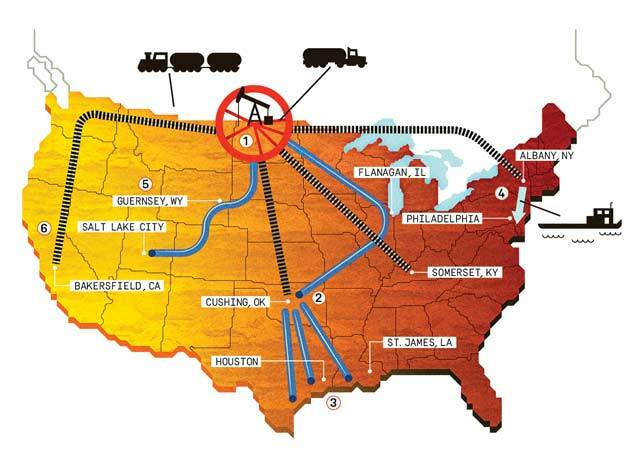 Enbridge Inc. stopped allowing high-sulfur crudes on its pipeline out of North Dakota in 2011, forcing North Dakota Sour producers to rely on more expensive transport such as trucks and trains, according to Auers. Producers outside the U.S. are also feeling pain. The price for Canadian bitumen -- the thick, sticky substance at the center of the heated debate over TransCanada Corp.’s Keystone XL pipeline -- fell to $8.35 last week, down from as much as $80 less than two years ago. Negative energy prices are rare but not unprecedented. Propane traded at a negative value in Edmonton, a key pipeline hub in oil-rich Alberta, for about three months last year. Oil refineries sometimes pay people to take away low-demand products such as sulfur or petroleum coke to free up space. However, those are both processing byproducts, while oil is a raw material, according to Auers.